Fortune Island signals a shift for Forza Horizon expansions. The add-ons for the previous game, Blizzard Mountain and Hot Wheels, created variation by fundamentally changing the experience of driving. The former put every car on ice and snow, and the latter confined them to relatively-thin orange tracks. They found novelty in mild subversion, just changing enough about Forza Horizon to warrant their own content packs. 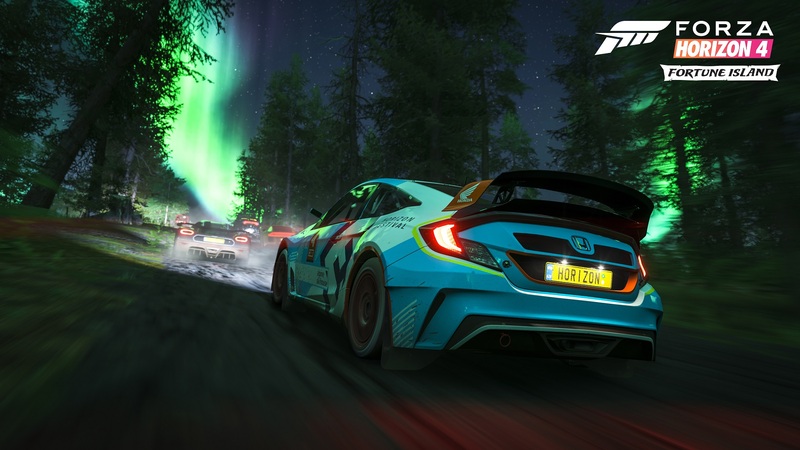 The first expansion for Forza Horizon 4, Fortune Island, doesn't rely on similar methods. It whisks us away to a remote island that's said to hide untold riches. In doing so, it turns a treasure hunt into a central mechanic. Impressively, it manages to be far more interesting than all the Hot Wheels loop-de-loops in the world. Forza Horizon 4: Fortune Island builds on the excellent foundation of the base game in a really smart way. There's a new island full of everything we'd expect -- a ton of races, a bunch of thrilling stunts, and some absolutely gorgeous vistas. (The nighttime aurora borealis is nothing short of majestic in its suffocating ethereal-ness.) All of this ties into a basic progression system. 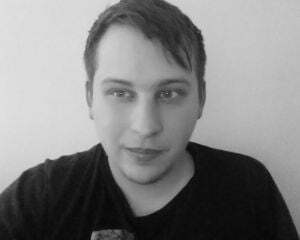 Do a bunch of it, whatever you like, to accumulate influence in order to open up more events. The solution is to trigger the Festival's Apex speed zone while in the 2017 Dodge RAM 1500 Rebel TRX Concept truck. Doing so will reveal an area where the treasure is hidden, along with a picture of the chest to provide some context. It's a twist on Barn Find Rumors, but one that's well worth the time. Each treasure is worth 1 million credits, meaning that there are 10 million credits up for grabs in the expansion. That will go a long way toward buying some of the super-expensive castles on the mainland. At its most dull, Fortune Island is something of a microcosm of Forza Horizon 4. It's a smaller island (63 roads compared to 531 roads), with similar stunt events and races. It's more Forza Horizon 4 which certainly isn't a knock against it. I never found myself bored when drifting around corners on the Needle Climb's perilously steep cliffs, all while surrounded by the grandeur of the northern lights. Apart from the treasure riddles, Fortune Island has one notable new inclusion. It adds Trailblazer Gates, which are a type of stunt that only prioritizes getting from Point A to Point B as quickly as possible. 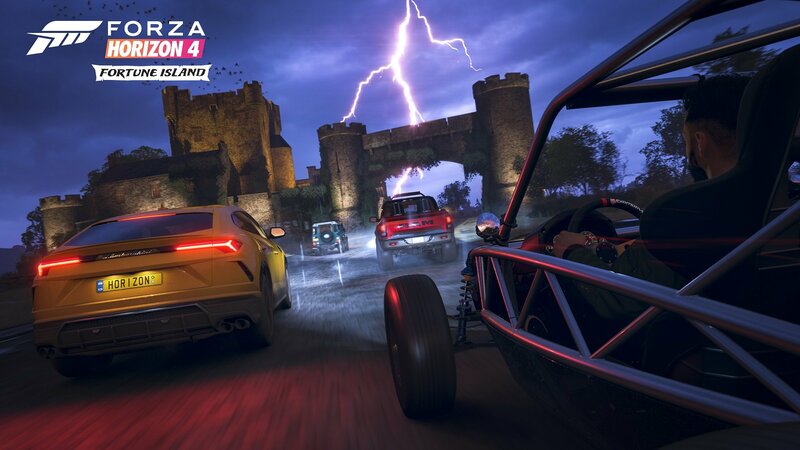 Trailblazer Gates punctuate the freeform nature of Forza Horizon. The fastest route is always the best route. Fortune Island also comes with 10 new vehicles, most of which are legitimately fun to drive. Although, it should be noted that some of them are progression locked and it'll require doing nearly everything in the expansion to earn them all. The new Fortune Island cars are: The 2019 Lamborghini Urus, the 2018 BMW M5, the 2017 Ram 1500 Rebel TRX Concept, the 2002 Koenigsegg CC8S, the 2018 Exomotive Exocet Off-Road, the 2012 Lamborghini Aventador J, the 2010 Saleen S5S Raptor, the 1953 Morris Minor Series II Traveler, the 2018 Funco Motorsports F9, and the 2015 Hoonigan GYMKHANA 8 Ford Fiesta ST RX43. It's more Forza Horizon 4, but Fortune Island has a hook that's worth its weight in gold. Turning an island into a giant scavenger hunt is the kind of allure that works perfectly with Forza Horizon. Elsewhere, completing events has its own intrinsic appeal; excelling at racing and stunts is rewarding because it's a racing and stunts game. In Fortune Island, progression brings about a sense of mystery and discovery. That's a reward that's nearly as rich as the millions of credits scattered about the island.